Most small businesses find accounting too complicated and time-consuming. 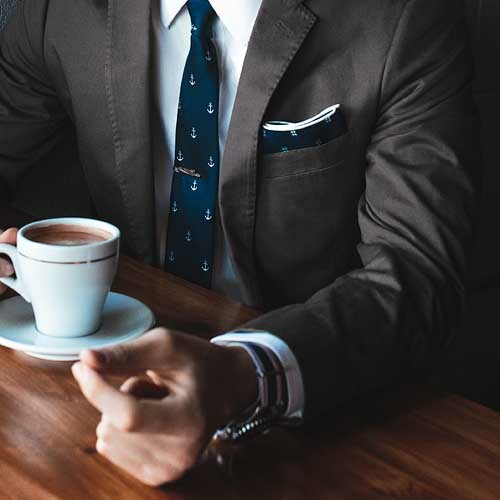 Your accountant will prepare our yearly accounts anyway, so a lot of that time is just wasted. Bookkeeping is much simpler (especially the way we do it), and takes much less of your time. With Bookkeeping Today you can keep clear records, giving your accountant less work to do, and save on accountancy fees. 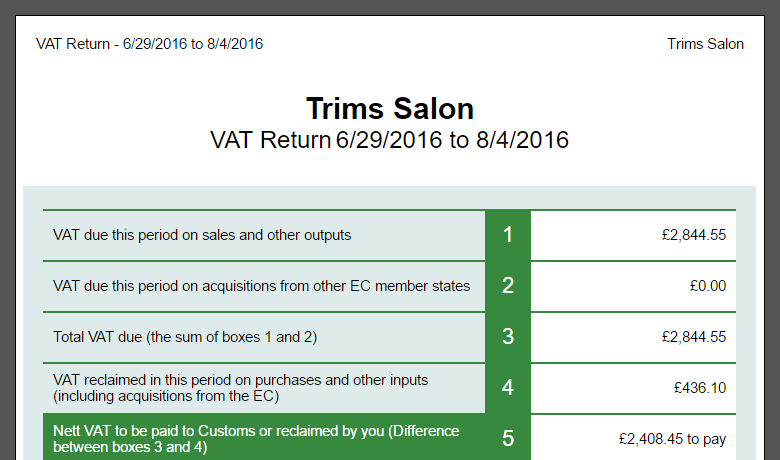 Easy VAT Returns and Reports On Any Device. Bookkeeping Today is a simple cash-book for small businesses. You can record your sales, purchases and other transactions, and if you are VAT registered, you can produce your full VAT Return, and EC sales figures if you are exporting. Use a PC, Tablet, Phone, or Macintosh. You are free to do your bookkeeping anywhere and on any device. You can start on an iPad, and finish off on a laptop - it's up to you! 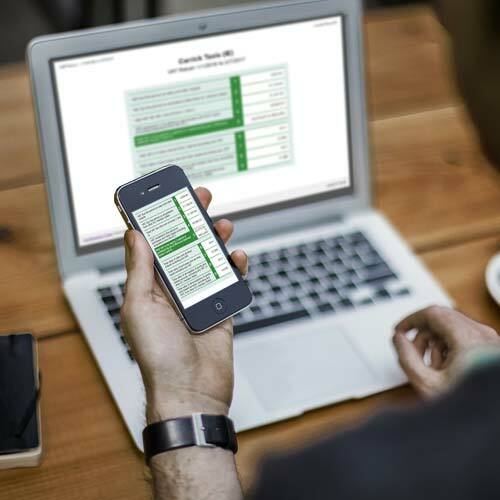 Spreadsheets For Your Accountant When They Need Them. When it's time for your accountant to do your accounts or taxes (or whenever you need), you can easily save your data as a spreadsheet file. Bookkeeping Today produces MS Excel files, a standard format that all accountants use. 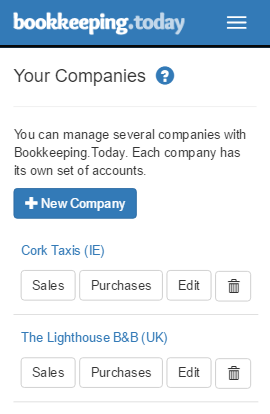 Bookkeeping Today was built to be multi-company. You can run several companies with a single login, each with it's own set of accounts. Are you bookkeeping for 2, 5 or 100 businesses? Bookkeeping Today will make that easy for you. Entering sales and purchases is quick and simple with smart helpers to help you along. 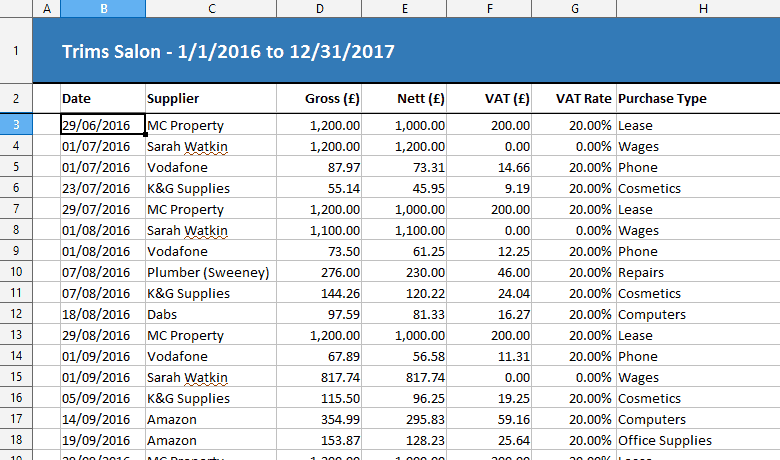 Our smart VAT calculator means you only have to enter the Gross or Nett price, it will calculate the rest, and smart lookups will pre-fill details of existing customer and suppliers to save you time. Search your transactions for text or by date, so the details are always easy to find. 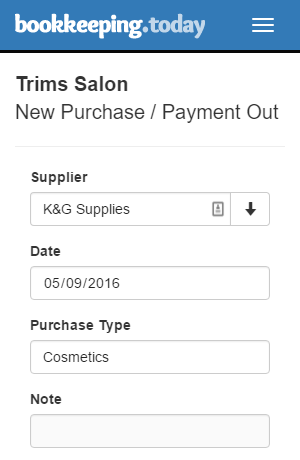 The sales and purchases lists can be customised to show just the details you want, and are easy to use on mobile devices and phones! 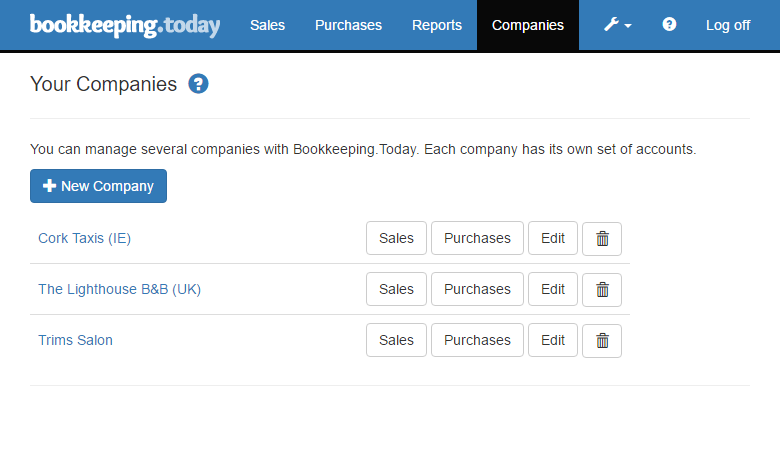 Bookkeeping Today's charts are a great way to get an overview of your business, letting you see how income and expenses happen over time. They are also a great way to see totals and other information. 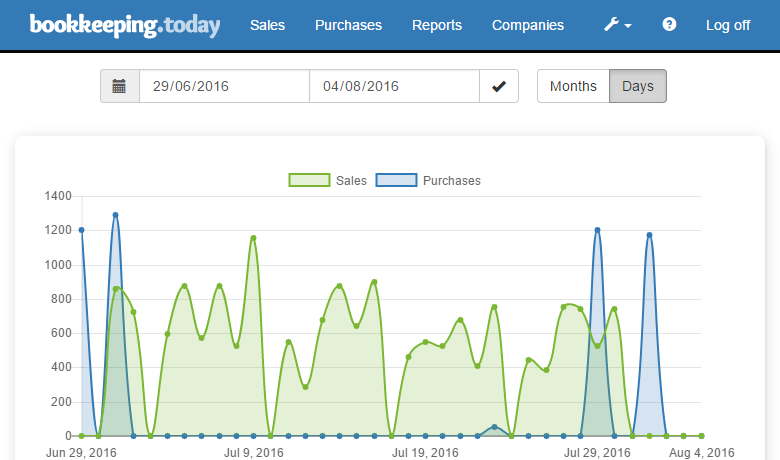 For example, if you want to see your total sales for a day or month, the sales chart has that for you! Bookkeeping Today's reports are fast and easy to understand, and can be viewed as a web page or as a PDF file for easy printing. Bookkeeping Today has full VAT reporting, including VAT Returns. And, if you are an exporter it has your EC Sales List. You can quickly save all or part of your data as a spreadsheet. Ideal for sending to your accountant for your end of year taxes. Bookkeeping Today creates MS Excel files, which are compatible with MS Office, LibreOffice, and OpenOffice, and can be used on PC, Mac, Android and Apple devices. Bookkeeping Today is now recognised for Making Tax Digital for VAT by HMRC! 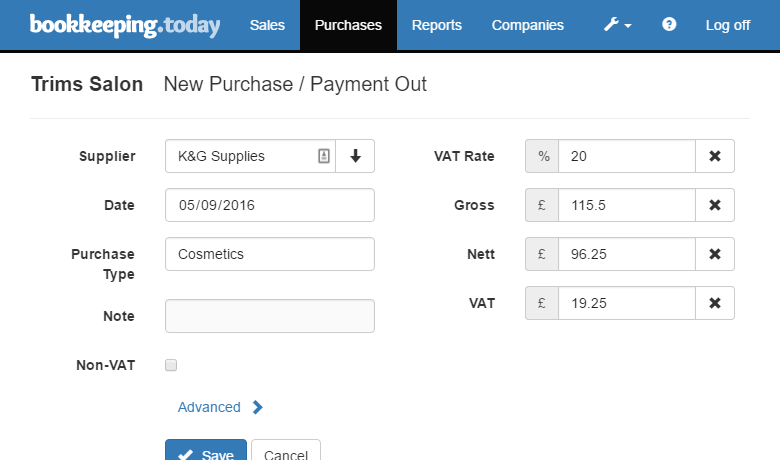 v0.9.6 New - Making Tax Digital for VAT added for UK companies. v0.9.5 Update - Added totals to several reports. 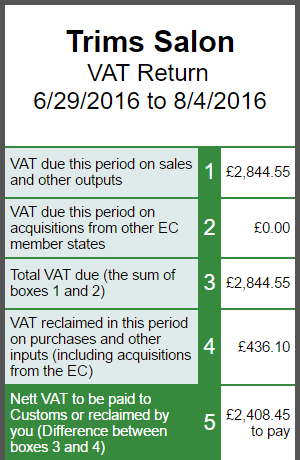 v0.9.4 New - Added VAT registration number to company details in preparation for HMRC's Making Tax Digital for VAT. v0.9.3 Fix - International characters are handled better when searching your transactions. 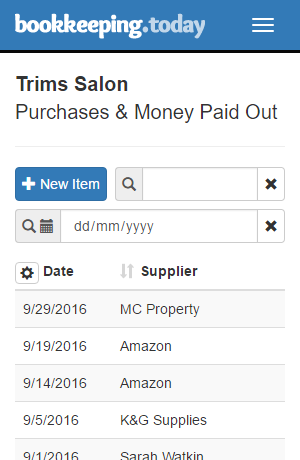 v0.9.2 New - Summary reports can be ordered alphabetically, by value, or by number of transactions. 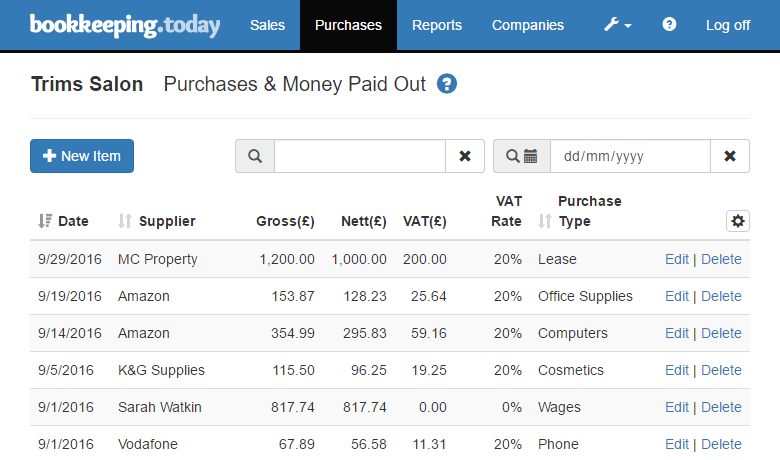 v0.9.1 New - Added Customer and Supplier summary reports, giving you details on where your income is coming from and where you are spending your money. 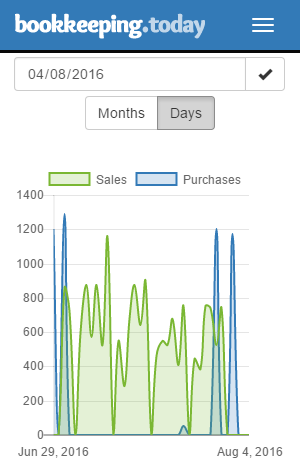 v0.9 New - Added Sales and Purchase summary reports, giving you a detailed breakdown of your income and spending. v0.8.9 Fix - Reports and exports were affected by the new date picker control in Firefox 57.
v0.8.8 Fix - exporting would not allow some dates for some languages. 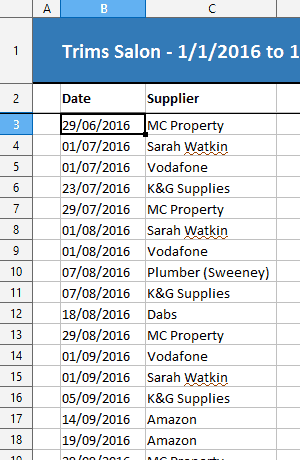 Impoved - exported spreadsheets have more standardised date formatting. v0.8.7 Update - just a little bit prettier. v0.8.6 Fix - a rare problem with dates.